Planning Ontario's electricity sector should have been a topic of interest when, on December 2nd 2015, the province's Auditor General included a chapter on Electricity Power System Planning in her annual report. The report received a lot of attention, but our power system planning process did not. The fall of the arbitrary, yet long-standing, 10700 megawatt target for non-hydroelectric renewable energy would indicate a return of professionalism in planning Ontario's electricity sector. Before 10700 was the Integrated Power System Plan (IPSP) process. I've added emphasis, but quoted from the OPA verbatim. Increase Ontario's use of renewable energy such as hydroelectric, wind, solar, and biomass for electricity generation. The plan should ... increase the total capacity of renewable energy sources used in Ontario to 15,700 MW by 2025. Spreadsheet comparing OPA Supply Mix Advice from 2005 to estimated actual 2015 data. 19 days later, on September 18th 2008, a Minister of Energy and Infrastructure essentially killed 3 years of work with an unintelligible directive amending the 2006 Supply Mix directive. The seemingly benign attack on professional planning sent Ontario's electricity planning into a tailspin it is yet to climb out of. George Smitherman had been in the portfolio for all of two months before killing off the IPSP. He has credited then Premier Dalton McGuinty with "Ontario's tilt toward green energy" - the truth is likely they both played a large part. John Spears wrote that McGuinty was convinced to change course by the late German anti-nuclear activist Hermann Scheer and Canadian pop science broadcaster David Suzuki, "on a hot day in June 2008". A super ministry, Energy and Infrastructure was created, and Smitherman, McGuinty's Deputy Premier, became the Minister. A little over a year later, in September 2009, the Green Energy Act (GEA) passed, effectively ending professional electricity sector planning. It took a while for the GEA to result in increased contracting. In fact, at first it did the opposite. The OPA showed contracted capacity decreased in the quarters after the GEA passed, but this was almost certainly due to higher rates being lobbied for. In 2015 the Auditor General reported these realized higher rates will add over $9 billion to Ontario's ratepayers costs above what the same capacity would have cost under the programs the GEA's feed-in tariffs (FITs) replaced. Once the rich FIT rates were in place, contracted capacity quickly soared. From creation through the second quarter of 2010, about 2500 megawatts (MW) of wind and solar capacity had been contracted. 18 months later an additional 5,200 MW were contracted at the new higher rates. 10700 by 2018. The number wasn't explained, but perhaps it made some sense. That was the minimum "Ontario demand" in 2009. The number, combined with the green energy act's efforts to give the "renewables" supply priority, appears intended to make baseload generation uneconomic. From the perspective that, "Nuclear energy and renewable energies cannot be combined,” 10700 made sense to kill off thoughts of refurbishing 10,000 MW of nuclear. Numeracy proved troubling for the government. The long term energy plan (LTEP) that followed the 10700 target was supposed to be the start of a new, professional, IPSP process. It included both refurbished nuclear and the renewables target I allege is intended to displace nuclear. Not surprising The IPSP process working with that contradiction was buried before a fall 2011 election. It is unknown to the public what it contained. The 2011 election wiped out the ruling Liberal party in rural Ontario. A growing opposition to energy policies that neutered local governments and financially punished residents, particularly those lacking access to natural gas supply, was no small part of losing those seats. The government survived as the same policies proved popular in the urban areas served by natural gas and oblivious to the impacts of their voting on the rest of Ontario. Still 10700 MW. The expectations were generators would enter commercial operation within 3 years of the contract data, so "by 2018" and "contracted by 2015" did not indicate a change. That report didn't satisfy anybody - or accomplish anything at all. The government tried another Long Term Energy Plan in 2013 (LTEP 2013), in which new generation of all types was delayed. LTEP 2013 hid an upcoming need for new supply by referring to it as "Planned Flexibility." This capacity shortfall was expected to appear as 406 MW in 2019 and grow to 3,642 MW in 2022. Had the IESO been learning from experience, they'd have learned wind and solar have value only in displacing fuels, and the lack of fuels in Ontario's generation, along with the limited need for "flexible" supply until at least 2024, means dollars spent on newly contracted supply will be mostly wasted. 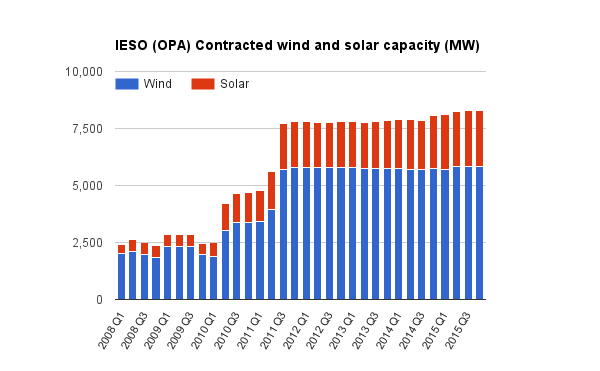 From the fall of 2011 to March 2015 an uneasy truce existed in Ontario as no significant wind capacity was contracted. At times the truce was strengthened, such as when the government reduced the Korean Consortium deal in 2013, and shortly thereafter ended the FIT offers for large industrial wind. There were lows too, such as the punishment of a successful appeal against the Ostrander Point industrial wind project with approvals of the nearby White Pines and Amherst Island projects. She knew there were real concerns about the impact of industrial wind turbines and the health and well-being of those living nearby. She knew the issues raised by conservation groups about the threat these machines posed to the natural life in and around Ostrander Point. She said municipal leaders needed to play a greater role in the development of renewable energy in their communities. Wynne became Liberal leader, and thus Premier, early in 2013, long after the final large FIT procurement of July 2011. The long-standing but uneasy truce was smashed with the March announcement of new large wind contracts. Of 5 large industrial wind projects contracted in what is dubbed Large Renewable Procurement I (LRP I), three were cited in areas that had made clear they did not welcome the machines. One of the areas is Dutton Dunwich, described in one official municipal document as, "An Industrial Wind Turbine free zone, designed to protect our unique environment." The government/IESO claims the contract was awarded due to the points system in its race-based procurement system. Despite 84% of Dutton-Dunwich residents voting against siting industrial wind turbines in their municipality, the contract is being justified by the participation in the bidding of six First Nations communities (Fort Severn, Keewaywin, Deer Lake, North Spirit Lake, McDowell Lake and Poplar Hill), mostly located north of the 50th parallel along with 95% of the wind potential in the province. CBC reports, "there are apparently three local Aboriginal bands nearby that are opposed to the project but were not consulted." ... complete the evaluation and selection of LRP II proposals in order to issue contracts under LRP II no later than May 1, 2018. This directive is unlikely to help the IESO stay on a path to "10,700 MW of wind, solar and bio-energy (in-service) by 2021." Few FIT projects were completed within 3 years of contracting - many still are not complete and it's been 4 3/4 years since the final large wind contracts were awarded. The directive's May 1, 2018 date is pertinent, falling within the period Ontario's next election is likely to be held. The minister's directive gives the government the option of again pandering to poorly informed urban supporters, flashing 10700 as a green credential, or of suspending the procurement until after an election if sentiment changes. The government is promising a new Long Term Energy Plan prior to the next election. I doubt they'll explain a basis for 10700. It's not a number based on anything related to electricity sector planning anymore - if it ever was. 10700 is now just an electioneering tool. According to the Ontario Energy Report Q4 2015 the province ended the year with approximately 9,000 MW of hydroelectric capacity connected to transmission and distribution systems (with the 1,250 MW Quebec intertie project hydro may be considered 10,250 MW), about 4,000 MW of wind (it's ~4,500 MW now), 603 MW of bioenergy and 2,078 MW of solar. This is roughly the IPSP plan for 2025 except solar is increased by 1800 MW. The planned refurbishment outage plans compared are from figure 14 in the 2013 Long Term Energy Plan and Slide 27 of the IESO's March 23, 2016 "Preliminary Outlook and Discussion..." slide deck. Samsung did get two new projects contracted (North Kent and Belle River), but the capacity was part of the the Korean Consortium contract. ...the theoretical potential is vast – in the order of 600,000 MW, or roughly 20 times Ontario’s current demand – the logistical and other constraints make it unrealistic to harvest all of this potential. ... determined the potential for wind generation capacity across Ontario as 630,000 MW, capable of producing 1,700 TWh of energy production annually. ... roughly 95% of the potential is located north of the 50th parallel of latitude, which lies above the northern-most stretches of the Trans-Canada Highway. This puts it effectively out of reach of Ontario’s existing electric transmission system. there are roughly 7,000 MW of wind power within 10 kilometres (km) of high-voltage transmission lines.